I never had it striped down this far to weigh it in the 20+ years I had it. 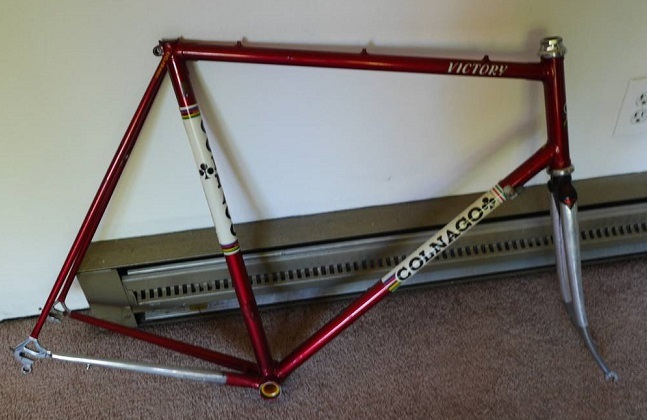 But to my surprise, the 1984 SLX frame/fork and steel campy headset is 5.8 lb. If you really want a nice lightweight steel frame, the Cherubim Sticky comes in at 1.35kg (under 3lbs). Both TT and DT are 1" diameter. Man, I now need to take out my steel Tomassini and polish it up. "take out my steel Tomassini"
2/11/18 3:06 PM Greg's Anvil juiced me up a bit. 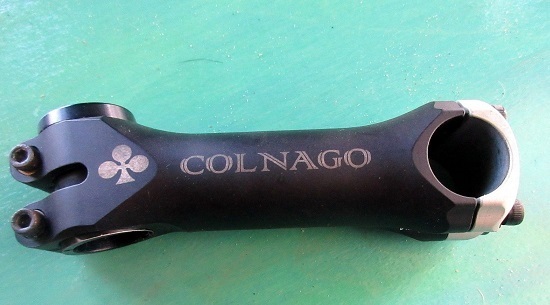 Spent some effort to clean chrome [not fork] and paint deeply to decide how recoverable the Nago is. Not unhappy so far, still need to hit the Chain stay with some semi-chrome. I kind of don't want to make it so nice I won't ride it. As in total refinish. [$!?] So leaning cleaning up and redoing the previous touch ups I did years ago. Once I mix a matched/faded Saroni batch of paint, I will use that for the drop fills and to just paint the fork to match. Refilling yellow in all the right places/engravings prior. Partial repainting further over chrome CS probably. Then clear over it all including new Panels and other decals. Shooting for a 90+% mostly orig aesthetic. The paint is pretty good actually for 33 years old. 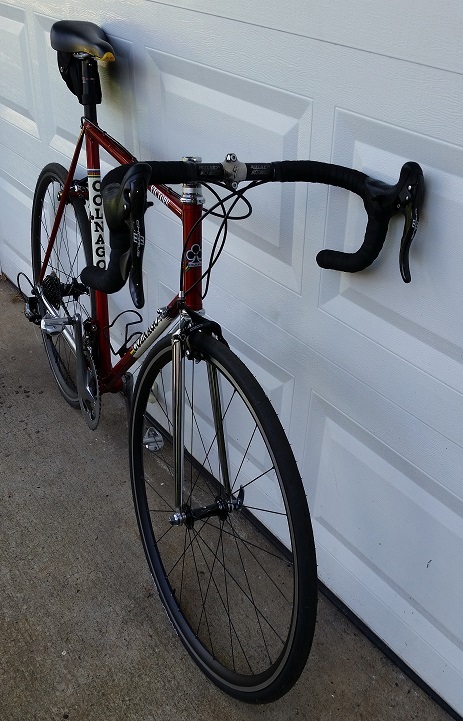 I ordered some re-pro vinyl Nago panels and SLX Tubing decal I trashed in the bike stand years ago not realizing it was not cleared over. Will probably just toss on a 7800 Groupo, have two still from 11s upgrades. Unless I find a nice ERGO groupo at some point before/during/after. But 7800 is pretty light as groups go FWIW. Image removed [now that it is a whole bike again. Looking better. Problem with vinyl decals is the amount of clear it takes to make things level, the Anvil took 18! coats. 2/13/18 4:51 PM 18 coats? Dude, were you off your medication? "the Anvil took 18! coats"
Coats of what is my question? I expect I'll use two part Urethane to seal down the vinyl repro panels, then use Nitro to re-clear and build/level. I actually have a lot of experience doing this with Electric guitar I build from scratch. And a filtered positive pressure spray booth I made in a corner of the shop. And this got even more clear coats after the pre assemble state in this pic. Not me bro Dan, I'd be happy to fax you a copy of Tom Kellog's invoice for the repaint though. Yay. 2/14/18 6:24 AM Why do you care if the decals are level? It seems pretty pointless to pile on a bunch of paint to do so. 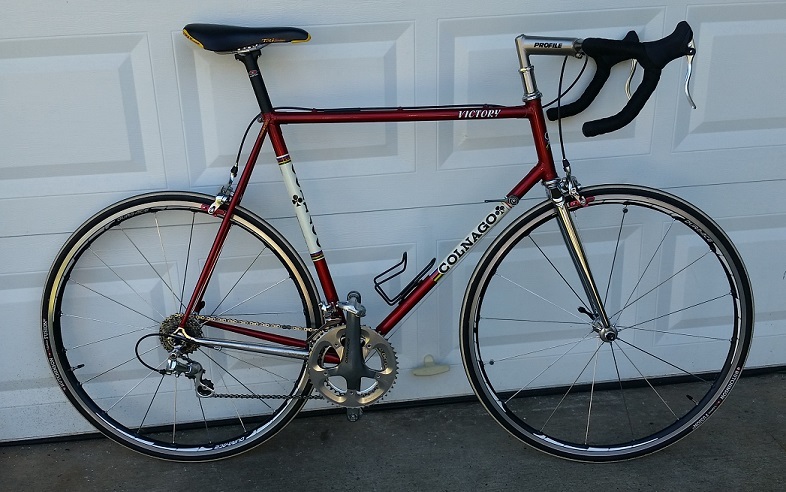 RE: 7800- still the Shimano pinnacle as far as I'm concerned. The exposed cables are funky, but every other solution to get the same light action has resulted in cable wear issues. 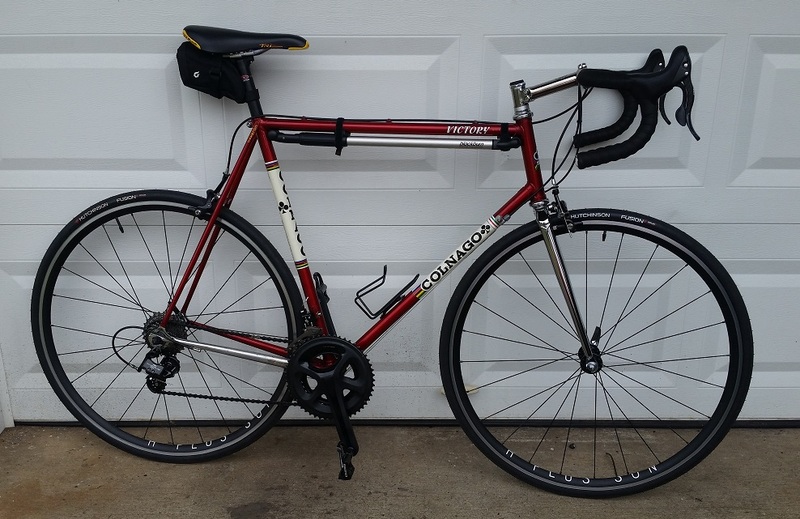 My c40 came with 7800, and I was going to pull it off and put on 10 spd Campy, but after a few rides I sold the surplus Campy and decided to keep it. Places like CyclArt will make any decals they can't get. I've thought of having them restore my '83 Fat Chance with the ubercool original "cartoon" decals. "7800- still the Shimano pinnacle "
I've yet to find any other shifers as buttery. Being I have two mint sets, I will have to decide. The Di2 has spoiled me back to no cables jutting out again. My disc Strong has 10s indexed BarCons, total run under tape and shift perfectly. "pile on a bunch of paint to do so." I get that too. My first Strong I had no decals under the clear. I have updated the over the clear 'STRONG' to his newer style at a point. I didn't bother with the disc one, all cleared over. Not saying a desktop inkjet printed Raleigh red and yellow panel will hold up to very much direct sunlight, but 21st century vehicle advertising demonstrates the inks do exist. Betting this is where Dan's CyclArt note comes in. (It's too bad in the video she used a pure white mug, but for a fleeting instant while she applies the decal, the substrate reveals to be clear. I got one of those eBay forks Walter has used on a few bikes. Came damaged, so until I negotiated with the seller I did an interim install. Looks like a clumsy laborer pushed it too far into the buffer wheel and the buffer hub hit it. So a few tiny spots the chrome is breached I will address. [He credited me back 50% last night]. Just made a honker spacer out of the cut off piece of steerer from the Green Strong Disk bike. I did not have handlebar I want to put the 7800 STIs on handy, so stole bars off the SS and put a lone friction DT shifter to shift rear and Tubeless 7850 Wheel with Hutchinson tubeless tires. Going for a ride here in a bit now that we are seeing a 60^ day, and even better tomorrow and Monday it looks like. Yum! 25 mile jaunt, fun and a few compliments. we gotta get you a 90-deg stem! I got something up my sleeve actually. And it does include a 90^ stem. Or a slight angle set to the up position. So Walter et al may un-pucker that sphincter a little bit. Hopefully this is less objectionable until a final solution. ;) And the polished Titanium sure gets along with the chrome fork aesthetically. 6/4 Ti old school 'Specialized 1" Open Face Stem'. This is a new one for even me, I will call it a semi threadless setup. ;) The stack of the Ti stem is the spacer now, and it is clamped onto the steer tube as well. Removed a lot of wonky looks, but not quite all of it. ;)\ What can I do if my back won't bend to the old position anymore, not ride my ample inventory of go fast bikes? Should hold me off until I procure one of these in 90^ or flipable. Silver or Black could work. Need shorter reach bars if I keep that stem on there. Got some parts today, just had to for the Victory. Off with the Shimano, on with the Campy. Just had to. YBN SLA 11speed black chain with missing link. Be selling the cassette and lock ring. Will be using 11s Shimano wheel/cassette. Wheels pictured are 26mm tires and a 14-28 Juniors cassette. This works big/big, which I would never do anyway. I will get the 34/50 cranks on tonight or tomorrow. But I wonder if the front DR braze on will allow for a low enough distance with the 50 chainring. I may have to put on 36/52 chainrings. 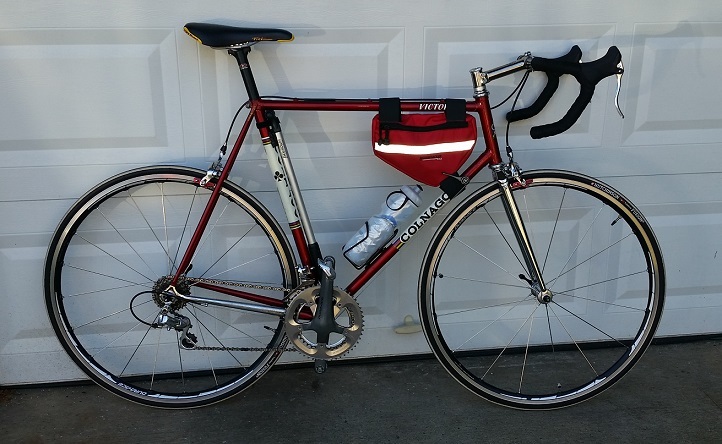 19.4 lb in these pics with 2 tubes in the seat bag, 6500 SPD pedals. This also surprised me a bit. 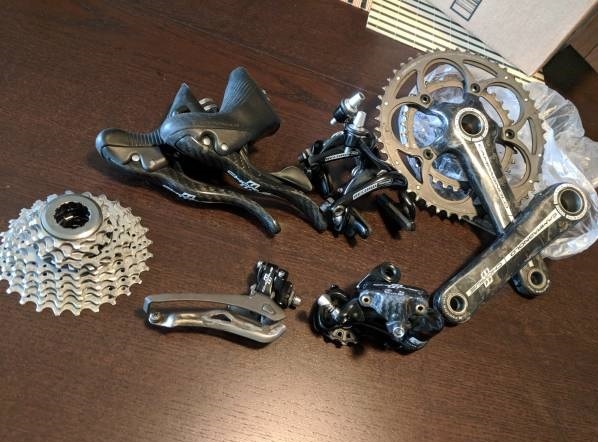 Tossed on 5800 36/52 crankset [same BB for 7800] while I await the 52 tooth chainring for the Chorus cranks. As I suspected, the braze on will not allow the front DR to go low enough for a 50 tooth chainring for comfort. Probably work, but NG as far I am concerned.